According to research, in behaviour, appearance and chromosome type this species is not a typical Amazon; further studies indicated that it should be classified in another genus. The Yellow-faced Amazon also has two colour phases, one of which is male-linked. Green morph: Both adults green in colour, the feathers widely edged darker green; yellow forehead and crown to around eyes and cheeks; yellow/orange ear coverts; deep orange sides of breast to flanks and axillary feathers; green tail with orange/red at base. Bill dull yellow with grey along ridge of upper mandible; pink/red cere. Eye ring white. Eye yellow. Yellow morph: Male-head and neck entirely yellow; yellow/orange ear coverts; green upper breast washed with yellow, the feathers widely edged with darker green; dark yellow lower breast and upper abdomen, becoming orange/red on sides of breast to flanks, axillaries and inner lesser underwing coverts; yellow/green tail with red at base; pink/red cere and unfeathered lores. Female-yellow/green lower breast and upper abdomen, the feathers widely edged darker green. Green morph: Duller than adults, with yellow confined to forehead, forecrown and area around eyes to ear coverts; rest of head green; green underparts, the feathers widely edged darker green. Eye brown. Yellow morph: As in adult female but duller, with yellow confined to forehead, crown, and area around eyes to cheeks; rest of head green. Eye brown. Calls made in flight are raucous; at rest softer and more musical. Fruits such as: apple, orange, banana, pear, pomegranate, cactus fruits, forming about 30 or more percent of the diet; vegetables such as: carrot, celery, green beans and peas in the pod; green leaves such as: Swiss chard, lettuce, sowthistle, dandelion, chickweed; spray millet; fresh corn; small seed mix such as: millet, canary, and smaller amounts of oats, safflower and a little hemp; limited sunflower seed; cooked beans and pulses, and boiled maize and complete kibble. Enjoys bathing, so provide overhead misters or bowls of water; also is a vigorous chewer so provide bird-safe, unsprayed flowering branches, fir, pine, elder and willow boughs, vegetable tanned leather toys, wooden block toys, and lots of browse and different sized perches. Vertical 10" x 10" x 24" (25.4cm x 25.4cm x 61cm). By 1993 two-thirds of the Cerrado region where this species is a specialist had been moderately or severely altered by agriculture, heavy cattle ranching, invasive grasses, pesticide use and yearly burning. Interior of E and S Brazil, from S Piaui and S Maranhao south to Mato Grosso and W Sao Paulo; also to N and C Bolivia and N Paraguay. Found up to 300m (984 ft) in deciduous and semi-arid deciduous woodlands and scrub, mostly cerrado woodlands with Mauritia palms; also drier caatinga scrub along riverways. May also be found around cultivated areas. Feeds on fruits, seeds, unripe guava and mango. Seen in pairs and flocks of up to 35 individuals. Nests in open area in cerrado trees or tall terrestrial termitaria. Movements (seasonal or nomadic) poorly known. Peak foraging activity occurs in the morning and early afternoon. 3 elliptical eggs, 40.5 x 32.0mm (1.6 x 1.2 in). 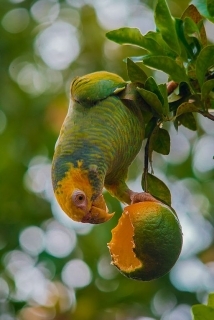 Research: Nesting biology of the Yellow-faced Parrot, a species without nest-site fidelity: an indication of high cavity availability?